EUCAP’s Maritime Operational Capability Project reached a milestone today in Berbera, when the Somaliland Coast Guard (SLCG) received three fast and modern boats with trailers and spare parts donated by Sweden. The SLCG also received three cars: two from the EU Delegation and one from EUCAP, to support building slipways and other necessary facilities for the boats. Additionally, 80 SLCG officers received training for safe and efficient use of the boats. Basic safety training was given to 50 officers, while 30 officers received maintenance and technology and navigation and operational training. In her speech on the occasion of the hand-over ceremony, EUCAP Head of Mission Maria-Cristina Stepanescu referred to the partnership among the Somaliland Coast Guard, the Berbera Maritime and Fishing Academy (BMFA), UNODC, and the European Union (EU). 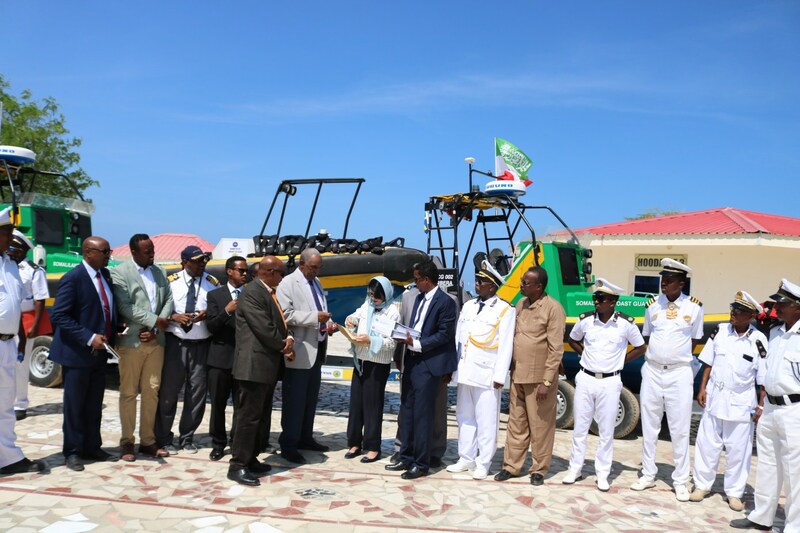 “This project, aiming at enhancing the Somaliland Coast Guard capacities is an epitome of the comprehensive approach and cooperation between the Somaliland authorities, the international community and the EU. Sweden as an EU Member State donated the much needed vehicles and also sent experts to train Somaliland officers in handling and maintaining the boats”, said Ms Stepanescu. Several dignitaries from Somaliland and the EU attended the handover ceremony, including the Somaliland Deputy Minister of Interior, H.E. Mohamed Musa Diriya, the Somaliland Coastguard Commander Admiral Mahamed Hussein Farah, the Governor of Sahil Region, Jama Yusuf, the Deputy Attorney General, Yusuf Abdullahi, the Governor of Sahel/Berbera Region, the President of the BMFA Abdiqani and representatives of the Embassy of Sweden, counsellor Johan Svensson and Political Officer Jenney Andersson. The port of Berbera is of crucial importance to the Somaliland maritime economy, and EUCAP supports this development through capacity building of the SLCG. The SLCG is also vital to the development of the maritime rule of law, which means that the SLCG needs to be a champion in respecting human rights and gender equality. Thus it was natural that international campaign “16 Days of Activism against Gender-Based Violence” was also addressed in the handover ceremony. EUCAP is a civilian EU mission, under the auspices of the Common Security and Defence Policy, which assists Somaliland in strengthening its capacity to ensure maritime security. Previous articleSomaliland:Offering the West a salutary lesson?